Looking for something fun to do with your family this Friday? 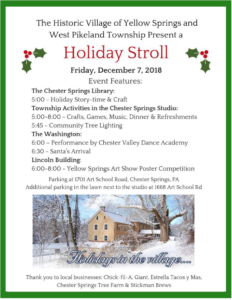 Join CVDA a for an evening of family fun at Historic Yellow Springs. Enjoy arts & crafts, cookie decorating, hot chocolate, and a visit from Santa! The CVDA Company will be performing a number of dances that are sure to get you in the holiday spirit! Nutcracker 2018 Ornaments & More! Nutcracker Ornaments & DVDs – Last Chance!